If I could teach you anything, I think above all it would be how to be happy. It’s not an easy lesson. Happiness isn’t a switch on or off. Sometimes it's complicated. I believe that happiness is easier for some than for others. But it’s also a choice. It’s easy to be miserable. Like everything else in life, it takes a little hard work to be happy. I believe it’s a never ending journey, an ongoing battle, a decision you have to make everyday. How am I going to be happy? Of course happiness is different for everyone. For me, right now (keep in mind, happiness can change) happiness is being a mommy. My happy is my son’s ever-smiling pinch-able cheeks, his Popeye arms with the little wrist roll, his wolf and monkey impression. It’s the first time he stacked his blocks all by himself, and the giggling in his crib as his pushes his chubby little feet through the slats just to be tickled. For me happiness is having a great relationship with my husband. It's the kiss my husband leaves me with every morning without fail, our little inside jokes (are you magical?) The way our son runs up to him with his arms outstretched, and how he climbs up on Mark to wrap his arms around his neck when he has to leave for work. It's the solid hug that I usually need by the time he gets home from work. It's the way my husband instantly calms our dogs from the time he gets home, and how he doesn't mind a 105 pound creature sitting in his lap, licking his face. For me happiness is "me-time." It's a pedicure, a gel-manicure, a girls night or a work weekend. It's a good book or a weekend afternoon nap (you know like in the BC days-- Before Children.) It's getting showered and dressed every day-- though I'm the first to admit this doesn't always happen, and yoga pants have become my best friend even though they've never seen a yoga class. For me happiness is relationships with family and friends and good communication. It's also good health for myself, my family and friends. For me happiness is a clean, organized home. A perfect example of when happiness can be hard work. For me happiness is a vacation every once in a while, the opportunity to do nothing and lay in the sun. To see new things and meet all kinds of people. But the point is, happiness won’t just jump into your bed at 6AM every morning. You probably won't always wake up smiling, like you do now little one. You'll have to go out and find happiness. You have to figure it out, every day. You may have to look under some rocks, and that’s okay—the good stuff usually isn’t in the first place you look. You’ll have to come to know what sparks your happiness—really and truly because there will be times when you’ve found something that’s just a happy-mask, and not the real thing. You’ll learn to know the difference. I hope you find your happy. I hope you can get up every morning if not with a smile on your face, than at least with a plan on where to find it, or a memory of where you left it. 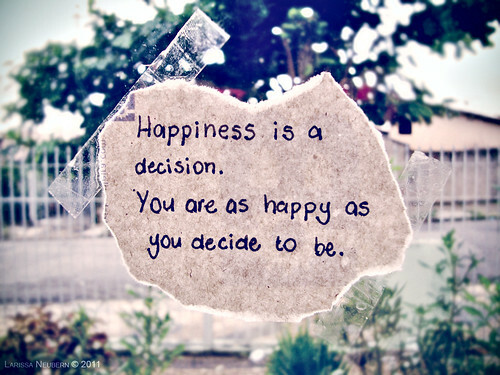 Find your happiness, spread your happiness. Make a choice to be happy, every day of your life. There are a lot of things I want to teach my children, and some lessons aren't always easy to teach over breakfast or on the way to playgroup, which is why I'm posting them here. Life Lessons is a series of posts on all the things I want to pass on to my children. From the silly to the serious, and in no particular order, these lessons are a reminder to them and to myself of all the important things in life.